The Emerald Coast Wildlife Refuge has moved to a new home in Navarre. When it was incorporated as a nonprofit organization in 2004, the refuge operated out of volunteer homes. It was later located in Destin and then on Okaloosa Island. Its coverage area extends from Escambia County to western Bay County. Most people are familiar with the rescue of sea creatures or birds, as well as woodland creatures such as foxes or raccoons. But only refuge insiders know that the organization dealt with 127 different species last year. Bill Andersen, president of the board of directors, and wife Carol donated the 2-plus acre parcel for the new location of the refuge in 2017. Its site in Navarre is on Clopton’s Circle, near East Bay and just off State Road 87. Carol Andersen estimated the total cost of the project at slightly more than $720,000. That money came from donations and fundraising. ▪ A medical center with a full surgical suite — pre-op, post-op, recovery and nursery as well as a necropsy suite. ▪ An education outreach center that includes a visitor center, gift shop and education center with displays and indoor/outdoor classrooms. ▪ Animal habitats that include both rehabilitation and animal ambassador enclosures. The Andersens became familiar with the refuge through unforeseen circumstances. Not long after that, the Andersens fostered and released seven pelicans. “Seeing them after putting them back in the wild was just everything to me,” Carol said. The refuge staff includes Shelby Proie, wildlife rehabilitator and marine mammal stranding coordinator; Michelle Pettis, wildlife rehabilitator and volunteer/intern coordinator; and Dr. Phil Blumer, veterinarian. ▪ Refuge volunteers (diets, feeding and cleaning). ▪ Foster volunteers who take animals home and bring them in for weekly checkups. ▪ Marine mammal stranding team. ▪ Docents and education volunteers. Anna Hackney of Navarre is working toward a wildlife rehabilitation license while serving on the rescue team. She attended the University of West Florida and Troy University in Alabama and has a master’s degree in public administration. Intern Tabitha Hall has a degree in wildlife biology with a minor in wildlife rehabilitation from Lees-McCrae College in North Carolina. Her husband, Jacob, is stationed with the Air Force at Hurlburt Field. 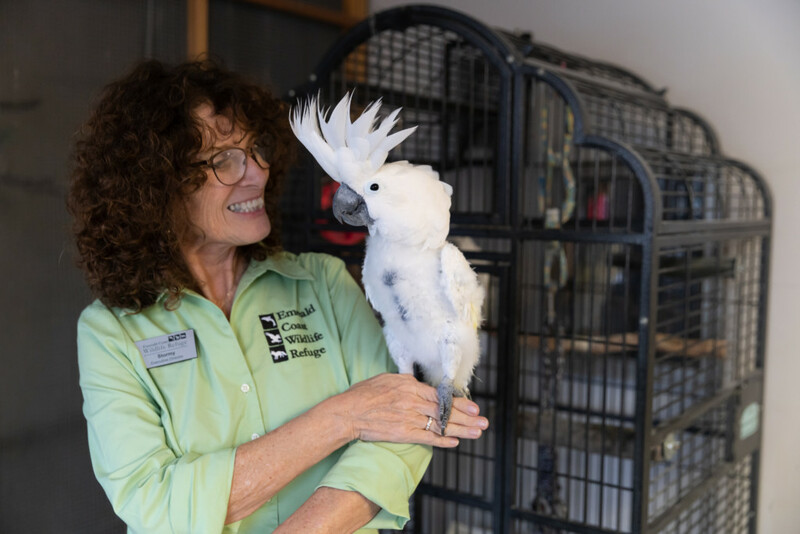 Since joining the refuge last July, Hall has made it a point to give hope to people concerned about the survival of an animal. New Location! Emerald Coast Wildlife Refuge is relocating and expanding to Clopton’s Circle, near East Bay and just off State Road 87 in Navarre.